The SoftRock Lite II, available at http://fivedash.com, is inexpensive, and works well with WriteLog. Build one and connect it to your rig’s IF output, WriteLog can display a panadapter on its Band Maps. 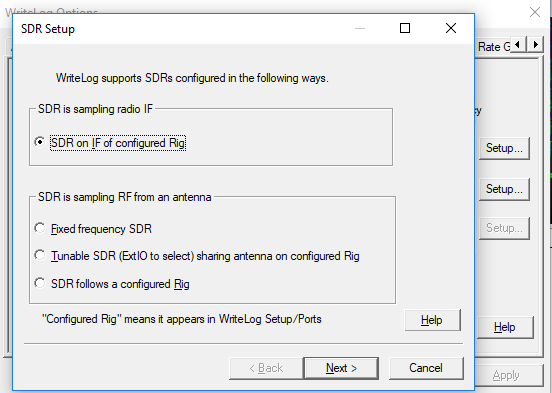 Unlike the dongles discussed in prior blog posts, the SoftRock requires no SDR-specific software. Its output is audio frequency and connects to the Line IN of a Windows Sound Recording device. 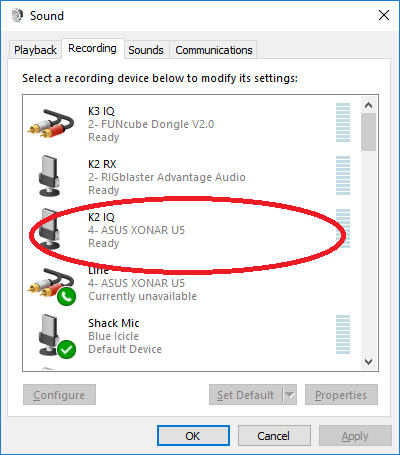 Start in Windows and bring up its “Recording Devices” panel. 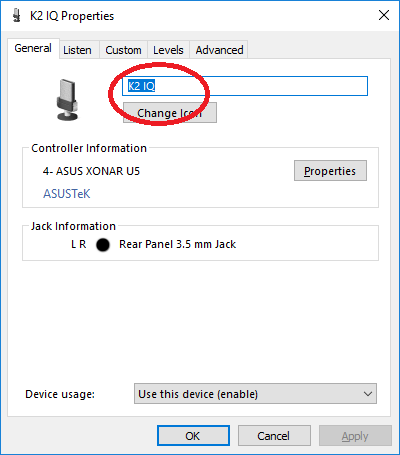 In my case, I have plugged the audio output from my SoftRock II into an ASUS XONAR U5 Line In. Double click it to bring up its Properties and give it a more mnemonic name. I chose “K2 IQ” for its name. Also check the Custom tab. This device has AGC and you get different results with AGC on or off. In my case, they were both acceptable for my purposes. The Level tab in my case can safely be turned all the way to 100% because the output level from the SoftRock II doesn’t overload it even on strong signals in the IF. 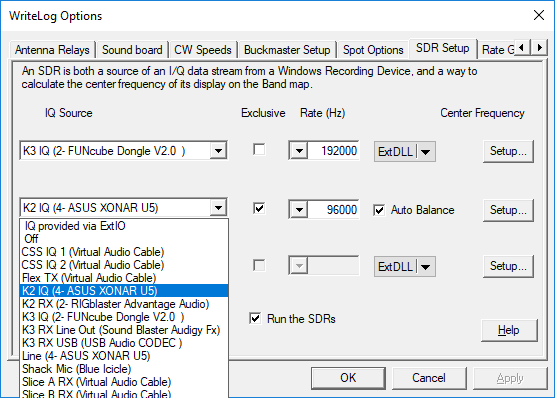 If you have a reason to run another SDR package concurrent with WriteLog on this same device, then check out the Advanced tab and set the Shared Mode rate and make sure its 2-channel stereo. Now bring up WriteLog and chose Setup/SDR-Setup. On any row under IQ Source, chose the sound device. I have the K2 IQ device selected here. For Exclusive, I recommend turned the check ON. Doing so gives you a choice of Rates. 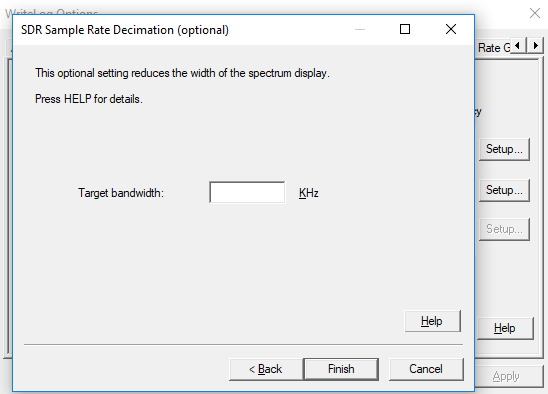 The width, in Hz, of the SDR display will match the Rate, in Hz that the SDR operates. I chose 96,000. For the Soft Rock, I recommend the Auto Balance check box be on, unless you are trying to make repeatable measurements. With Auto Balance on, WriteLog monitors the power in the I and Q channels and tweaks the balance to make the power levels match. If you’re using some other SDR, by the way, some digitizers do their own I/Q balancing, and for those setups its best to leave WriteLog’s Auto Balance off. Either way, the check box only makes a few dB difference. 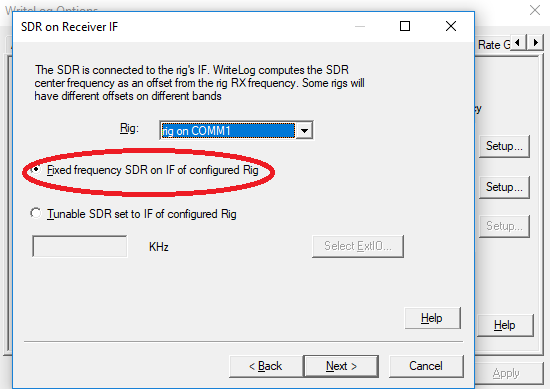 I have my SoftRock connected to the IF output on my (modified) K2, so SDR on IF of configured Rig is the answer. Click Next. My K2 is on COM1. The SoftRock is crystal-controlled fixed frequency. WriteLog doesn’t need to know its frequency. WriteLog simply needs to know that it doesn’t have to control the SDR’s frequency. In the case of the SoftRock II, its frequency is set by a crystal you install when you build it. In the case of my K2, I bought the 4.921MHz option. Click Next. This is a screen we don’t need to set up now. Its contents depend on the rig’s IF conversion scheme, which is outside the scope of this post. We’ll do the minimum. Click the + button and then OK to get a just one row in the offsets table. Our spectrum on our Band Map will be centered on the K2’s frequency (which is off by a few KHz) and it might run backwards (in which case we need to check Flip I/Q) but we’ll ignore those issues and press on. For the SoftRock in Exclusive mode, we got to set the SDR width on the first wizard page. We can low-pass that down to something lower on this page, but there is no point in that. If 96KHz is too wide, then change it on the first page and leave this page alone. Then Finish. 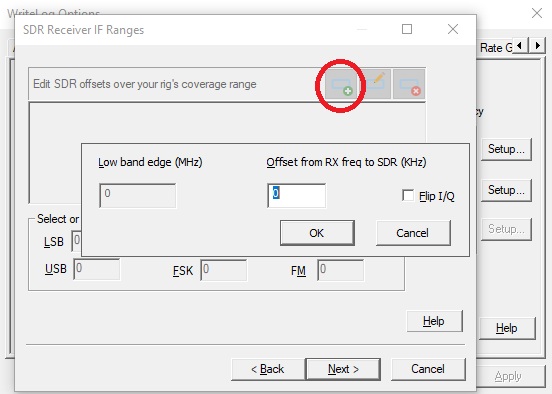 Later blog posts describe how to calibrate WriteLogs SDR IF Ranges.